When Asus announced plans to launch a $199 PC earlier this year, I was skeptical but optimistic. I wasn’t particularly surprised when the company announced that the low price would only be available to governments that ordered in bulk (and perhaps waved taxes). But $299 still seemed like a pretty good price. Now that the EEE PC is set to go on sale in the US this week, it looks like the cheapest model available will be $399. The unit includes a 900MHz celeron processor, a 3.5 hour battery, 4GB of flash memory, an SD expansion slot, 3 USB ports, a VGA port, a 7-inch 800 x 480 pixel screen, and a custom version of Xandros Linux with OpenOffice, Firefox, and other goodies. It’s a bit more pricey than I’d hoped, but I’m still sorely tempted to drop the money and pick up the 2 pound mini-laptop. You wouldn’t think that there’s that much difference between a 2 pound laptop and a 6 pound laptop until you’ve tried lugging the 6 pounder around a few places. And it’s not like the little PC isn’t worth $400. Sure, you could find a more powerful machine on sale for a similar price, but there’s no way you’re going to find an ultra-portable laptop that comes anywhere close. Since the EEE PC is a full fledged computer, you can install alternate operating systems. The folks at ZDNet UK have already managed to get Ubuntu up and running, although it’s doubtful whether Ubuntu is actually more useful than the Xandros OS that ships with the computer. And while you could install Windows on the EEE PC, odds are the operating system would eat up most of your internal memory. 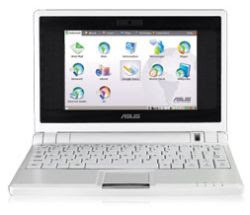 But Asus plans to release another version of the EEE PC later this year/early next year with Windows XP preloaded. Again, I had a feeling that would drive up the price, but I had no idea how much. InfoWorld is reporting that machines running Windows XP will sell for as much as $1000. That’s a far cry from $199. Now, I know that Microsoft charges a lot of money for its operating systems. And I know that the price includes Microsoft Office. But I’m hoping you get a hardware bump for that extra $600. Because you can get a pretty nice laptop or UMPC for $1000. I still haven’t decided whether I’m going to drop $400 on an EEE PC. But I can tell you one thing. I won’t be paying $1000 for one. Update: It looks like there’s a good chance the XP version of the EEE PC will not cost $1000. Yahoo! News seems to have done a poor job of condensing Dan Nystedt’s IDG article. InfoWorld has what looks like it may be the original article, where Nystedt states that the difference between the Linux and XP versions of the EEE PC is expected to be about NT$1000. That’s a far cry from saying the XP version will cost $1000 US. In fact, it could mean the XP version will sell for just about $40-$50 more than the Linux PC.